Are you feeling frustrated every time you see your doctor? Like you aren’t being heard and not getting the help you need? My guess is that if you are feeling disappointed with your visits with your pain doctor, you probably aren’t alone. Let’s face it, it can be difficult to create a satisfying doctor-patient relationship, largely because time together is so limited. Physicians only have about 15 minutes to meet with their patients, and much of that time is spent focused on a computer screen doing electronic record keeping (which frustrates everyone). Making matters worse, the fallout from the opioid crisis has put tremendous pressure on doctors to focus more time and attention on precautionary protocols, further lessening the time we have to devote to treating patients. All of this can leave very little time for you to have meaningful conversations with your doctor. Be clear, with yourself and with your doctor, about your true goals. For example, you may want to go back to work, run a 5K again, or play catch with your kids. Whatever the goals may be, that is where you want to keep the focus when meeting with your physicians. Sure, you may want to be pain-free so you can do whatever you want, but keeping your goals more practical and tangible will move things along in a more positive direction. Let your doctor know exactly what is standing in the way of you reaching your goals. 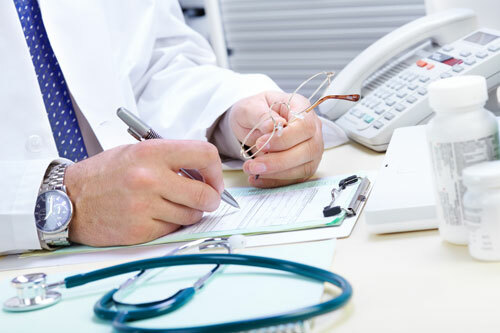 Remember – the most important part of any evaluation is what the patient communicates to their doctor; test results and MRI reports should be secondary. When you walk, where exactly does it hurt? Is it a sharp pain, dull ache, or burning sensation? The more descriptive the picture, the better equipped your physician will be to understand how to help you. Try to be clear and focused at your appointment, and avoid tangents or deviating from your script. Write out your questions and concerns ahead of time to ensure your doctor covers what is most important to you. Sometimes medical appointments can feel overwhelming, making it hard to remember key details later. So, take notes during your visit, or bring somebody to take notes for you, so you can review it all later (having your doctor write things down for you or print something off the computer takes precious time away from your appointment, so do as much of the note-taking on your own as you can). Regardless of what type of pain problems you may have, there is a good chance that it is impacting how you function on a daily basis. That includes everything from walking, driving, doing chores at home, to working and playing. And how well you can engage in these types of activities directly correlates to your quality of life, sense of independence, and general happiness. Shift the focus of your medical visits away from just how you feel, and more toward how you function. Resist the temptation to unload only negative feedback and complaints. Be sure to let your physician know what is helping, and talk about the steps you’re taking to improve your health. Discussing the positive impact that your work together is having in your life can help your doctor-patient relationship grow and deepen. Try incorporating these 5 basic strategies into your future appointments and watch your results and satisfaction rise to new heights. You can learn more about navigating our tricky health care system in my book, Conquer Your Chronic Pain: A Life-Changing Drug-Free Approach for Relief, Recovery, and Restoration.